The number of injured in the volcano-triggered tsunami along the coast of Sunda Strait in Indonesia jumped significantly to 14,059, as search and rescue operations continue. The death toll from the Dec 22 tsunami, triggered by the eruption of Anak Krakatau volcano and the ensuing underwater landslide, has reached at least 437 people. The total number of displaced persons was put lower to 33,719, after reaching a peak of 40,386 on Friday. , The tsunami destroyed 2,752 houses and 510 ships. The spokesman of national disaster management agency Sutopo Purwo Nugroho said search and rescue operations continued as many were believed to remain missing in the provinces of Banten and Lampung, with the emergency status being extended. The strong eruption of the Anak Krakatau volcano has reduced the height of the volcano to 110 meters from 338 meters, volcanologists said. The Anak Krakatau volcano, or “Child of Krakatoa” volcano in English, is one of the 129 active volcanoes in Indonesia, a nation home to 17,500 islands and which sits on a vulnerable quake-hit zone so called “the Pacific Ring of Fire”. The threats from MS-13 had become incessant. There were handwritten letters, phone calls and text messages that all said the same thing: The gang was preparing to kill Ronald Acevedo. El Salvador had the world’s highest murder rate. Acevedo had already been stabbed once. His family pieced together a plan. They paid a smuggler to take Acevedo to the United States border. The plan didn’t work. After eight months in detention, Acevedo, 20, abruptly withdrew his asylum claim. He was deported to El Salvador on Nov. 29, 2017. 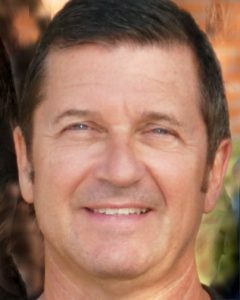 He disappeared on Dec. 5, 2017, and his body was later found in the trunk of a car, wrapped in white sheets. An autopsy showed signs of torture. Acevedo’s case made its way through American immigration courts just as the White House launched attempts to reduce the number of people who are eligible for asylum, a protection that for nearly 70 years had served to shield victims of war and persecution. Some of those denied asylum are sent back to countries where their lives are put in immediate danger. In addition to Acevedo, The Post has identified another asylum seeker, Miguel Panameño, who was killed this year, months after being deported to El Salvador. He is buried in the same cemetery as Acevedo. Immigration lawyers in the United States believe many more cases exist. Some nongovernmental groups have made efforts to track the number of deaths, but there are no official mechanisms to catalogue them. Between 2012 and 2017, the United States denied asylum to 12,300 Salvadorans and deported them. The number of people applying for asylum in the United States has increased steadily over the past four years, as has the number of people denied asylum. Last year, 120,000 migrants made asylum claims in U.S. immigration courts, a fourfold increase from 2014. Many of those fleeing gang violence first attempt to disappear in another part of El Salvador before leaving the country. But MS-13 had, at least in some cases, tracked them down. As the high-stakes immigration debates rage nationally over walls, U.S. border troops, caravans and a federal government shutdown, crowded buses rolled into the downtown Greyhound station in El Paso. That’s where hundreds of migrant asylum-seekers were sent after federal detention centers hit full capacity as more and more people squeeze into ill-equipped border stations. U.S. authorities released more than 1,500 migrants this week in El Paso alone, including 522 on Wednesday, the largest single-day release. The scene in El Paso is being played out at many locations along the Texas and Arizona border. Church shelters recently have been taking in about 2,200 to 2,300 migrants a week. But the churches that host people remain overloaded. Without way stations like Annunciation, says newly elected U.S. Rep.- Veronica Escobar, (D-Texas), migrants who have been processed by ICE would end up on the streets homeless, hungry and without support. Estela Tomas Felipe was one of the more than 1,500 migrants released in El Paso this week. At the Greyhound station, Felipe, with her one-year-old daughter strapped to her back, was in good spirits, and heading to Birmingham, Alabama, to meet her husband, who left Guatemala two months ago. Following the deaths of two Guatemalan children this month who were in Customs and Border Protection custody, advocates expressed concern that US immigration authorities were rushing migrants through the asylum process. Felipe Gómez Alonzo, 8, who died Christmas Eve, tested positive for influenza B, according to the New Mexico Office of the Medical Investigator. Jakelin Caal, 7, also Guatemalan, died December 8 at an El Paso children’s hospital after being detained with her father and while preparing to travel by bus to a Border Patrol station in New Mexico. The chaos at the border has also been complicated by the partial government shutdown over President Donald Trump’s insistence on including funds for a border wall in the federal budget. Laith Yakona wants only one thing for Christmas, the same thing he has prayed for the last four Christmases: To spend the holidays with his family. War, bombings, kidnappings, death threats, and death squads failed to break up the Yakona family in their hometown of Baghdad before leaving for Jordan. Yet after a decade of their navigating the increasingly polarized war-torn Iraq and then a life in exile, one event has split the family in two: A new life in America. Yakona is one of thousands of Christian refugees from the Middle East whose arrival on American soil has been put on hold indefinitely amid the Trump administration’s slowdown and downsizing of the US refugee program. With the policy to tighten the borders, the US intake of refugees has dropped dramatically. In fiscal year 2017, the US government accepted a quota of 110,000 refugees. Under President Trump, the ceiling was lowered to 45,000 for fiscal year 2018. But according to the State Department, the US only took in half that number, 22,500, in 2018. The new Trump Administration policy has disproportionally impacted Christian refugees from Iraq, Syria, and Iran. The US intake of Christian refugees from across the Middle East was down 99 percent from 2017 to 2018, and for Iraqi Christians, down 98 percent, according to State Department statistics analyzed by World Relief, a Christian organization that advocates opening US borders to refugees. “American churches, primarily evangelical churches, may not realize that there is a dramatic slowdown in refugee resettlement, and they definitely don’t realize that persecuted Christians have been so dramatically shut out,” says Mathew Soerens, US director of church mobilization at World Relief. The UN agency for Palestinian refugees, UNRWA, needs to find about $350 million a year if the United States pulls all its funding, as threatened. The European Union said its members, which collectively represent the largest donor to UNRWA, will consult on how to fill the gap. With social services at risk for 5.4 million Palestinian refugees living in the occupied territories and the wider Middle East, including schooling for half a million children, here’s a look at the numbers and what they mean. The UN Relief and Works Agency for Palestine Refugees in the Near East, or UNRWA, was formed in 1949 to help Palestinians who fled at the time of the creation of the state of Israel. The United States has been a major donor for 70 years and US funding to the agency averaged $348 million for the five years 2013-2017. But earlier this year President Donald Trump’s administration paid only $60 million, a fraction of the expected US contribution, and on Friday it ordered a complete halt to any further funding. The US State Department said it was tired of shouldering a “very disproportionate” share of the agency’s spending. However, the US contribution from 2013-2017 represented an average of 28 percent, the same percentage used as the country’s fair share of UN peacekeeping costs. In an open letter issued today, the head of UNRWA, Pierre Krähenbühl, says there are 5.4 million refugees who have “undeniable” rights that “cannot be wished away”. UNRWA can’t be blamed for perpetuating the refugee issue, he says, arguing that it’s the whole world that has failed to resolve the conflict between Israel and Palestine. 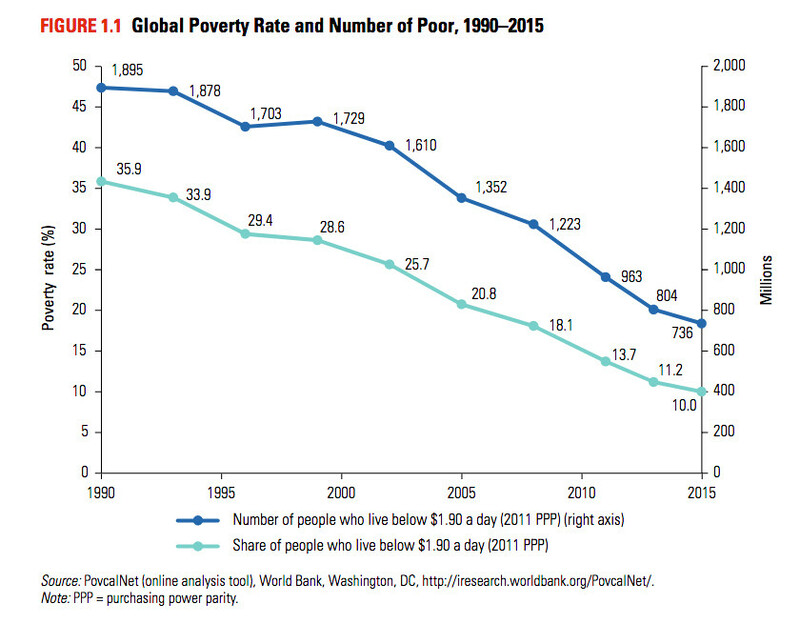 With the decline in extreme poverty. There’s been an overall improvement in global health. One such example: kids born in 2017 are much less likely to die in their first five years of life than kids born in 1990 were. The global under-five mortality rate fell from 93 per 1,000 to 39 to 1,000, meaning it fell by over 58 percent! We don’t have data for 2018 yet, but given the change just between 2015 and 2017, it’s likely there was a further decline. 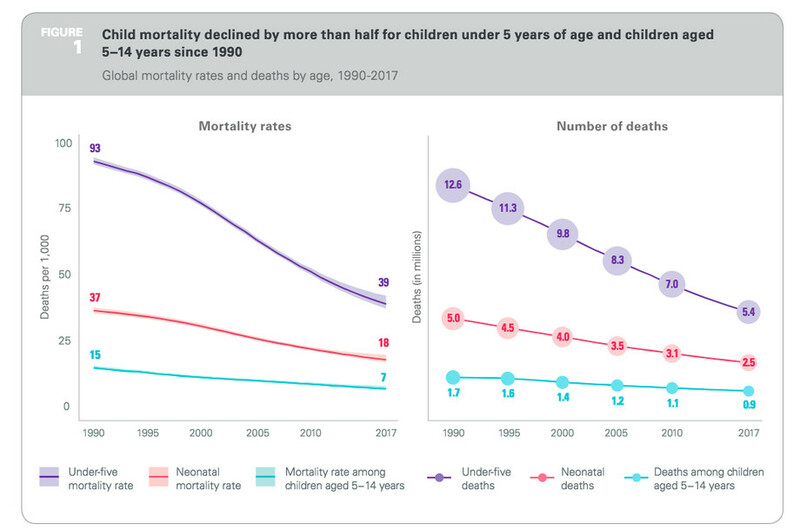 In 2015, the under-five mortality rate fell from 42 to 39 worldwide, meaning overall deaths fell from 5.8 million to 5.4 million. The extraordinary rate of economic growth in India and China — as well as slower but still significant growth in other developing countries — has led to a huge decline in the share of the world population living on less than $1.90 a day, from 35.9 percent in 1990 to only 10 percent in 2015. And the trend continues! The World Bank’s poverty statistics depend on household surveys in 164 different countries, that are carried out over different time periods, in different ways, and so forth, so it takes time for the group to produce point estimates for poverty in a given year. But it estimates that the 2018 rate will be about 8.6 percent, a notable decline from 2015. The headline alone made my heart sink. “7-year-old migrant girl taken into Border Patrol custody dies of dehydration, exhaustion.” I felt a wave of deep sadness, but no surprise. The girl was reportedly taken into United States Border Patrol custody last week along with her father. More than eight hours later, she began having seizures. Emergency responders measured her temperature at 105.7 degrees, and according to the Border Patrol, she had not had anything to eat or drink for several days. Earlier this year, Human Rights Watch reported how the US Border Patrol is harming children and families by detaining them in inhumane jail-like conditions. Migrant families commonly call the border jails hieleras, or freezers, for their frigid temperatures. These sometimes lack sufficient beds for families, leaving children to sleep on cold concrete floors. This brave mother put her finger on exactly the problem with US Border Patrol jails. They are built to punish – not to help – and that includes children like the 7-year-old who died last week. Authorities should urgently investigate her case, but more broadly, the US government should be asking itself why children are in these cells in the first place. The U.S. Senate has passed a resolution calling for an end to US military support to the Saudi-led coalition in the Yemen war. The measure marked the first time the Senate had invoked the 1973 War Powers Resolution to seek to curb the power of the president to take the US into an armed conflict. It marked a significant bipartisan rebuke to the Trump administration, which lobbied intensively against it. The independent senator Bernie Sanders who had pushed the resolution persistently throughout the year, called it “a historic moment”. “For decades, under Republican presidents and Democratic presidents, [with both] Republican Congresses and Democratic Congresses, the Congress of the United States has abdicated its constitutional responsibility for war-making,“ Sanders said. “It is not the president who has the responsibility under the Constitution to send our young men and women to war, it is the Congress. And we have got to take it back,” added Sanders while discussing the effort in the Senate to bring U.S. involvement in the Saudi war in Yemen to an end. Moments after the Senate vote to end American military assistance for Saudi Arabia’s war in Yemen, senators also unanimously approved a separate resolution to hold Crown Prince Mohammed bin Salman of Saudi Arabia personally responsible for the death of the journalist, Jamal Khashoggi.